Stephen Fortner Goldsmiths was founded and incorporated in 1996. Its formula for success over the past 11 years has been founded on the unique philosophy, "If we put our client's interests first and foremost, the money will follow." We are in the business of building relationships. We want you to get to know us. We will do everything we can to meet your jewellery needs. We only offer jewellery that we would be proud to have ourselves. We check everything, and I mean everything, for quality. 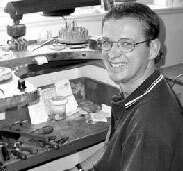 Every piece of jewellery is personally analyzed by Stephen Fortner, a goldsmith with over 25 year's experience in the jewellery industry. We hope you enjoy our hand-selected items offered for sale from our web site. See you again soon. Owner Stephen Fortner first started working at the Royal Canadian Mint in Ottawa over 25 years ago. Afterwards, he went on to work in a managerial role for, Henry Birks and Sons, one of the largest quality jewellers in Canada. Settling on the West coast of Canada, Stephen continued his artistic endeavours by designing and creating high quality custom jewellery. He is proud to supply clients with unique styles that are always of the highest quality. View our Quality Custom Jewellery Galleries.